Amazing photography, Amazing Team! The minute I saw the pictures from our engagement photo shoot on Cannery Row in Monterey CA, I knew I made the right decision and I could not settle for less for our Wedding Pictures!! So we had Manuel and his marvelous wife Melissa fly out to Cabo San Lucas to shoot our destination wedding. Best decision ever!! Manuel has a great eye for at finding the perfect locations for the best shots. Melissa has the “female” eye that all Brides will definitely appreciate! That combined with their awesome personality make it a great experience. 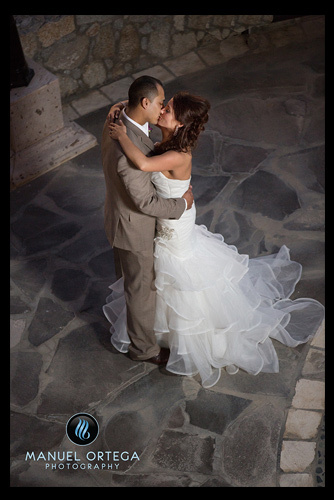 We love our Beautiful wedding pictures and Highly recommend Manuel Ortega Photography!! Our wedding day was October 25th, 2008 on the beach in beautiful Carmel CA. Manuel showed up early and was the consummate professional as he shot our wedding. Manuel knew exactly what my wife and I were looking for in our wedding photography. From the pre-wedding photos (of my beautiful wife), to the actual wedding and reception dinner Manuel was able to capture images that displayed the story of our day. His knowledge and skills came into play from the moment we arrived at the beach in the bright sunlight with Point Lobos in the background to the change in scenery the minute the fog rolled in. Not only did he capture photos that day of our wedding, but he captured images of our closest family and friends as the wedding was a very intimate affair with only 20 attendees. Manuel’s direction was clear and concise in allowing all the photos to not only optimize our family and setting, but enhance our experience of this special day. Daily I am reminded of this special day due to Manuel’s excellent and professional ability as the photos he captured are placed throughout our home. I sincerely feel that if you want your special day to be given special treatment, Manuel is the man for the job. I recommend him 100 percent without a doubt to all looking for the best wedding photographer in Monterey County, if not the whole state. To me, the most important service in a wedding is the photographer. Photographs last a lifetime, so selecting the right photographer to capture our special moment was crucial. Manuel is phenomenal and our pictures are amazing! He provided quality photos that truly captured the essence of our day. He was consistently professional, reliable, and personable. After meeting him I knew he had the personality we were looking for. Manuel made our wedding less stressful as he guided us step by step through the wedding process putting our fears at ease. I can honestly say he is the best wedding photographer in the Monterey bay! Highly Recommended!!!! Manuel is the best Wedding Photographer! He is the consummate professional, and was happily willing to work around our crazy schedule (two-day wedding in Santa Barbara and Pasadena). He was always early, prepared, and extremely friendly to all my guests. We had a non-traditional wedding, so he didn’t have a template as to what parts of the wedding to focus on (which required a lot of candid shots), he did a great job of capturing every special moment. The photos are beautiful, and I don’t think anyone could have done a better job. I would recommend his services a thousand times over. Keli and I would like to start off with thanking you for being an absolutely wonderful photographer for our engagement and wedding day. You are truly a pro, and it shows not only in your work but how you carry yourself. On the big day I felt like you thought of everything and really listened to us and made the pictures reflect us. We feel so fortunate to have such amazing pictures and every time we look at them I feel like we are right back in that day because you were able to capture it all! We wish you nothing but the best in your future and it is wonderful to have someone be a part of your special day when they are so passionate about their work, which you truly are! Manuel is a true professional. His ability to capture EVERY special moment is evident in his photography. Kris and I had the honor of having him photograph our wedding in Monterey and both of our sons’ baptisms at the Carmel mission. Manuel, thank you for your passion of photography, you are truly a gem!! Thank you so much Manuel for the beautiful senior portraits you took of Alex in Monterey. It’s going to be hard to decide which ones we want! You have a a rare talent and I am so happy you were available to photograph my daughter! You are an amazing photographer, my 2 yr. old son hates taking pictures, and YOU captured a special unforgettable moment in our lives!!! We have worked with other photographers in the past and let me tell you, we didn’t get that “rushed” feeling. I appreciate you taking the time around our busy schedule to accommodate us, and with such a short notice you made our Christmas a special one. We cannot thank you enough for the beautiful photos you took of our wedding in Salinas. The moments you captured will be cherished forever. You are very professional & very fun, we were overjoyed that you were able to stay through out our whole reception. We could not have been happier with the end results. Our wedding album was beyond our expectations. Viewing our images for the first time in your Wedding Photography studio in Monterey was an incredible experience! Thank you for everything! I just viewed Andrea & James wedding pictures and I must say you did an excellent job…your vision is unreal! THANK YOU so much for taking the ones of Mario & I with our kids, I was hoping for nice but they are SPECTACULAR!!! The photos turned out to be perfect family pictures and since we don’t get to see our Krystal very often, these photos will be very near & dear to our hearts. There’s no doubt you are the top photographer in the Monterey Bay! THANKS AGAIN…..YOU ROCK! I’m glad you were a part of Nov.19!! Your photography team is very professional and it was a pleasure to have you at the wedding! Thank u for capturing our beautiful day at the Eagle Ridge Golf Course in Gilroy CA! With so many tears and laughs, I can’t wait to see the pics, have a great Thanksgiving with your family! Manuel, just wanted to thank you for the wonderful job you did on my daughters high school senior pictures in Monterey. Your attention to detail and ability to make her feel comfortable about the experience truly added to the quality of the pictures. The delivered product was timely and even your delivered product was above the expectation (beautifully boxed with a bow). I know you have had a positive influence on my daughter because she has now started doing some photography for her friends as a hobby. That was a bonus! Thank you again, and I will be contacting you soon for our family portraits. “Remember to remember.”- The best piece of advice a good friend gave me before the big day. As soon as we got engaged the first thing I did before planning anything else was contact Manuel Ortega Photography in Monterey CA. I knew since high school that I wanted Manuel to photograph our wedding. I truly believe that the photographer and his work is one of the important elements of a wedding. They capture things that sometimes the bride and groom are too busy to see or unable to. I love seeing the memories that were created that day in photographs of our two families coming together as one. We can’t wait to see our wedding album because we both have seen how much detail of that memorable day unfolds page by page. Manuel, you are one of the best wedding photographers we’ve seen, and we’re truly blessed that you were able to capture the beginning of our lives together. Manuel – It has been an absolute pleasure working with your amazing wedding photography team at our wedding at Bayonet and Black Horse Golf Course! Thank you for giving us the gift of memories and capturing our dream wedding. We are happy and grateful to have had you be a part of it. We can’t stop looking at our wedding photos and can’t wait to get our album! Our families are extremely happy with your professionalism and attitude, you are simply the best! Manuel thank you so much for shooting our wedding in Monterey! You are kind and professional in every sense of the word! Needless to say you are now our go to photographer for any of our photography needs. Our wedding album is amazing and I can honestly say nobody could have done a better job, you are the best! Thanks again for everything! We just viewed our wedding pictures and I must say, capturing the moment is what Mr. Ortega does best. It was a true pleasure and joy working with a professional Monterey wedding photographer that made the experience that much more special for my wife and I. Manuel was very attentive and creative with his work. He made us feel at ease and truly made our personalities show through (my cheeks hurt from smiling by the end of the day). The finishing touch was how he made sure our daughter, family and friends were all part of the moment. There is no doubt that Manuel Ortega Photography is the best. Just take a look at his work, it speaks for itself. Thanks again Manuel for your artwork. Manuel…you brought tears to my eyes with our wedding album…I LOVE IT!!! I LOVE IT…I LOVE IT! Once again, your wedding photography team did an amazing job…the wedding pictures you captured are priceless. We especially loved our wedding portraits in Monterey! You are a true blessing…thank you! Thank you for doing such an amazing job with my grandparents’ 60th Wedding Anniversary in Hollister CA. You captured the most memorable and priceless moments. My grandparents mean the world to me & I am eternally grateful for your gift of such captivating photos that will remind me of the love & respect they shared for each other, long after they are both gone. It was such a pleasure to work with you. Your talent and professionalism is to be commended and I would recommend you in a heartbeat. I simply wanted to stop by and say THANK YOU for all your beautiful and dedicated work that made our wedding at the Mission in San Juan Bautista so special. Since the beginning of our journey you were so easy going which was very reassuring during the planning process. Not to mention our engagement session- you definitely listened to us and captured every detail of our essence as individuals/couple and what we wanted to capture in such delicate everlasting memories. During the big day I can honestly say you were a trooper making those huge family pictures work! In a nutshell, you captured everything we wanted and dreamed of. I loved the end product we are delighted with such beautiful pictures. Not only did we find a GREAT photographer but and kind hearted friend. Without hesitation we can say we could not have made a better choice for such meaningful and once in a lifetime day. Our day was perfect, and your quality of work captured it. Our most sincere thanks to you and Melissa! Every mother can attest to the special moments of their child’s milestones. For me, Mia’s senior photo session was a big one! Years back I didn’t believe that Mia would make it this far in her short life. Diagnosed with cancer at age three, we were unsure if she would succumb to the disease. Now here we are celebrating her life as a senior & you captured her beautifully in your portraits. You made her session personal & intimate and I really loved that about you. My daughter is my world & you treated her as though she was yours too. Thank you for what you do. I will forever be grateful. Check out my Yelp reviews to see more!